Price of this sock includes shipping. This wonderful alpaca sock is an excellent choice for warmth! 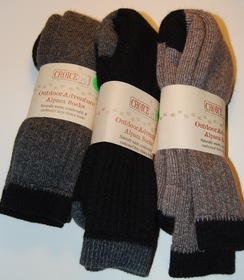 These socks are made with a terry inner design for added warmth and comfort. Perfect to wear for skiing, hiking, hunting, any outdoor activity or they are perfect for around the house too!